In this type of questions, a set of information pertaining to persons, objects or some other entities alongwith their qualities, which can be compared is provided. Candidates are required to arrange the given entities in either ascending or descending order on the basis of relative quality. At first look, such questions appear to be very simple but sometimes these are made tricky by infusing intricacies and complicated data. However, one can organize the given data quickly and easily by comprehending the given information in systematic manner. Sometimes, the given information may seem to be insufficient but a cogent and co-problem turns to be very simple. You may also find some superfluous statements, which are given to confuse you. You can recognise such statements in no time if you have gained command over such types of questions. If you haven't checked some of our latest quizzes, use below given links. Sometimes you are required to ascertain only the rank of a person either from top or bottom in a class or a group of persons.In determining the rank, the information about the total number of persons in the class or a group is a prerequisite otherwise you cannot determine the rank. Sometime the rank, of a person from either end is given and you are required to calculate the total number of persons. In another type of question on RANKING, you are required to ascertain some other qualities such as height, weight, marks, age etc. In this type of question on Ranking, the two extreme ends are occupied by the persons having the lowest and the highest degrees of quality that has to be compared. While solving such type of questions, you should employ certain symbols and notations to organize the given information so that you can use the data more conveniently and quickly too. 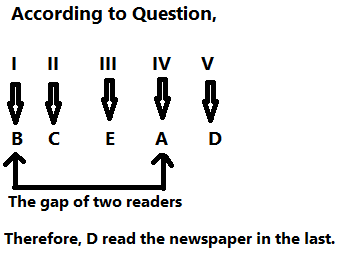 1.Five men A,B,C,D and E read a newspaper. The one who reads first give it to C, the one who reads last had taken it from A, E was not the first or last to read. There were two readers between B and A. Find the Person who read the newspaper last. 2.If you are eleventh in a queue starting either end. How many are there in the queue? 3.In a row of boys, if A who is 10th from the left and B who is 9th from the right interchange their positions, A becomes 15th from left. How many boys are there in the row? 4.A is older than B but younger than C. D is younger than E but older than A. If C is younger than D, who is the oldest of all? Therefore, E is the oldest among them. 5.Heavier coins are costlier. Ram's coin is heavier than Mohan's and costlier than Ramesh's. Naresh's coin is costlier than Ram's but lighter than Yogesh's. Ramesh's coin is costlier than Mohan's. So who is the owner of the costliest coin? 6.Among five friends, A is shorter than B but taller than E, C is slightly taller than B but D is slightly shorter than B and slighthy taller than A. Who is the shortest? Note: B > A > E .
7.There are five friends - S ,K , M, A , R, S is shorter than K, but taller than R. M is the tallest. A is a little shorter than K and little taller than S. Who has two persons taller and two persons shorter than him? 8.Of the five members of a panel sitting in a row, A is to the left of B, but n the right of C, D is on the right of B but is on the left of E. Find the member who is sitting in the middle? 9.A, B , C ,D and E are sitting on a bench. A is sitting next to B, C is sitting next to D, D is not sitting with E who is on the left end of the bench. C is on the second position from the right. A is on the right of B and E. A and C are sitting together. In which position is A sitting? A, P, R, X, S and Z are sitting in a row. S and Z are in the centre, and A and P are at the ends. R is sitting on the left of A. Then who is on the right of P?